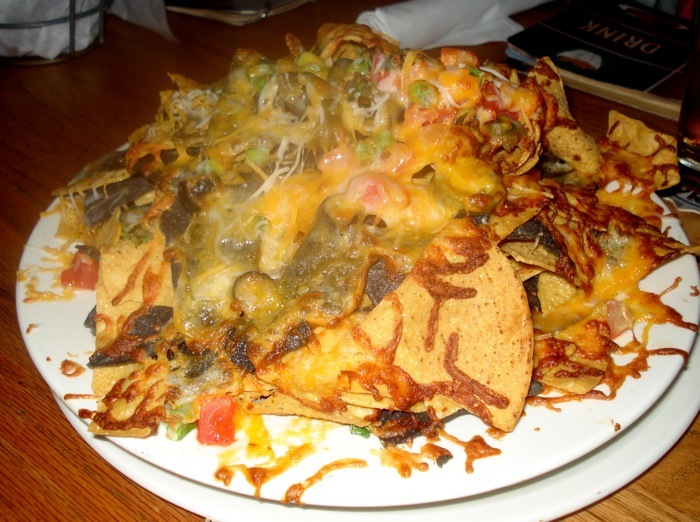 We’ve really delved back into the golden oldies of Nacho Patrol history with this review. Back in late 2008 when we started this blog, we were nacho virgins, just beginning to bud into a fruitful period of adolescence (nacholescence?). Yes, we were awkward and uncertain. The kinks hadn’t been worked out and perhaps the beer was flowing a bit too freely. We would hate, however, to be accused of inaccuracy, which is why we’ve taken it upon ourselves to re-review some classics. Last week, during the ill-fated Twins/Sox game, we took on Boston Beerworks for the second and very much last time. If you don’t remember, Beerworks was our seventh ever nacho review. We gave them a 23/40, which put them in the bottom ten. Spoiler alert: they’re probably going to stay there. Appearance: (4) These nachos try so hard to be colorful, but fail to achieve any glory since they are burnt beyond recognition. What could be multi-colored corn chips, orange shredded cheddar, and fresh tomatoes resemble nothing of their namesakes and are instead wan and depressingly beige. Quality: (5) High school home ec taught us that if you overcook something, it burns. Whoever the chef is at Beerworks must have failed out of that class because even after a YEAR of burning his nachos, he still makes them the same way. That is, poorly. We complained about this in November 2008, and nothing has changed. The cheese on this particular plate was burnt and flavorless. Lacking any gooieness whatsoever, the distribution suffered, and the entire mess was simply dry and dull. Though the foundation was fairly terrible, we did enjoy the kick from the jalepenos and found the chili quite tantalizing. Distribution: (3.1) By simple virtue of wanting to put them above Fenway Park (Nacho Patrolling isn’t a science as much as an arbitrary race again the clogging of our arteries), we probably awarded the distribution 3.1 points higher than they deserved. Unsurprisingly, crispy cheese slivers don’t do a lot to whet one’s appetite. The sparse toppings clumped together onto three of four chips leaving the rest greasy and devoid of excitement. Sour cream and salsa were on the side, further compounding the problem of dryness. The nail in the coffin had to be the pile of chip crumblies at the bottom. Did they just dump out the bottom of the chip bag onto our plate? If we’re going to have naked chips, they might as well be FULL naked chips. Price: (6) $9 for an ugly mass of chips and brownish carbon; $3 each to add chili, chicken, steak, or guacamole. Whatever. It’s Fenway. It seems fitting that Fenway Park and Beerworks should be nestled so closely together in the hierarchy of nacho disasters. They may be beloved relics in the Boston community, but perhaps it’s time for an upgrade.